Picture this Nikon fans 🙂 Coupon code “PICTURETHIS” drops the price of the factory refurbished Nikon 70-300mm f/4.5-6.3G ED VR DX AF-P lens from $198 to $150 with free shipping at BuyDIG until 2/11/18 or earlier if sold out. Buydig offers free 45-day returns as well. It’s Tokina time once again! The new condition Tokina 11-20mm f2.8 PRO DX lens is offered for $469 with free shipping and 4% promotional rewards (just under $19 in future purchases) at Adorama and B&H Photo in your choice of Canon or Nikon system. A quick look at the Stock Status Tracker reminded us that today is the last day of the user-listed Nikon D850 body only auction. As of the time of writing (aka OP as in Original Post as in 10:26am ET), the price is $2950 with 62 bids. Shipping is an extra $13~. Canon and Nikon fans, it’s your time at KEH Camera with a two day coupon running until Sunday 2/4/18 at 11:59pm eastern. Coupon code CANNIK02A gets you 8% off used Canon and Nikon camera gear. As usual, their shopping cart is the ultimate decider on what is eligible. Separately, the KEH Camera website offers free shipping on orders of $49 or more (continental 48 US States). The second development from the just-updated Stock Status Tracker is that the new condition imported grey market Nikon D850 body only by eBay seller “Deals All Year” has now dropped to $3250. The new condition at authorized Nikon USA dealers is $3300 (and still hard to find). Meanwhile the IRIX 15mm f/2.4 Blackstone Lens is on sale for $575 with free expedited shipping in the same three mounts at B&H Photo but no expiration date is mentioned on its sale. If you happen to want both the Nikon D7500 APS-C DSLR and the 18-55 DX VR and 70-300 f4.5-6.3G VR AF-P lenses, Costco has them in a bundle for $1600 with free shipping. You also get a 2-year extended warranty on the camera body (not the lenses) along with a 32GB SD card, an extra battery, a Nikon branded gagdet bag and a Nikon online class. This bundle may also be available at your local Costco store but they don’t have a store look-up option (yet???) on their website. Another thing that surfaced during the Stock Status Update is that there are two live classic bid-style auctions on the Nikon D850 body only running on eBay and as fate would have it, they both end a few hours apart from each other. The listings end next Tuesday though, so the prices will definitely go up by then. Another day, another update of the Stock Status Tracker and we have some action on the Nikon D850 body only. The camera is offered in new condition, imported grey-market with a 1-year seller warranty for $2280 with free shipping by eBay seller Deals All Year (99.8%, New Jersey, up to three per customer). The new condition price at authorized Nikon USA dealers is $3300. When the Amazon Price Bots play their game of thrones, you win sometimes because Amazon’s own price drops to match some of the 3rd-party sellers. Such is the case at the moment for the new condition Sigma 135mm f1.8 ART lens. You can get it for $1097 with free shipping in the Nikon F system and $1140 in the Canon EF system. These links point to Amazon’s own listing. Other 3rd-party sellers offer them there for less, but they don’t look like authorized dealers or recognizable names. … to the eBay Deals we go, where the BuyDIG eBay store is offering the manufacturer refurbished Nikon D750 body only for $1230 with free shipping and a 90-day Nikon USA warranty. Limit up to three per customer at the sale price. Over 800 units have been sold so far from this listing per eBay. B&H has it refurbished as well but for $1399 with free expedited shipping. PS: if you are participating in eBay Bucks, don’t forget to activate the 6% eBay Bucks promotion before making the purchase! Nikon revealed their first lens of 2018 at CES 2018, but decidedly not a consumer lens 🙂 It is the new Nikon NIKKOR 180-400mm f/4E TC1.4 FL ED VR AF-S available for pre-order for the price of a well used Honda Accord ($12,400) att Adorama and by Amazon itself and at B&H Photo. As usual with coupons, the shopping cart is the ultimate decider in what qualifies for the coupon in cases where it may not be clear what qualifies. Nikon D850 hunters, grab your wallets! The latest update of the Stock Status Tracker found the Nikon D850 body only available in “Used Condition 10” at B&H Photo for $2967 with free expedited shipping and a 90-day B&H used warranty. Supplies are very limited, so this may sell out very quickly! An old fashioned sale! The new condition Nikon D3400 with the 18-55 DX VR lens is on sale for $349 with free shipping at Amazon by Amazon itself with up to three per customer at the sale price. It is “temporarily out of stock” but you can order it. Since this is not a lightning deal, expiration time is unknown. PS: speaking of Nikon, running until Thursday night is a various discount coupon (8% to 15%) running at KEH Camera for used Nikon gear. If you don’t want/need the latest model (the second generation G2 lens), the first generation, new condition Tamron SP 24-70mm f2.8 DI VC USD is on sale for $899 with free expedited shipping in the Nikon system and Canon system, along with a FREE Hoya 82mm UV Haze NXT HMC Filter and 4% promotional rewards (around $36 to be used in future B&H purchases). IF you want a piece of the Nikon D850, but you just don’t want to wait, or pay $3300, the wide world of eBay sellers have an alternative for you! The official Nikon D850 Japanese Brochure. This is no single page leaflet. 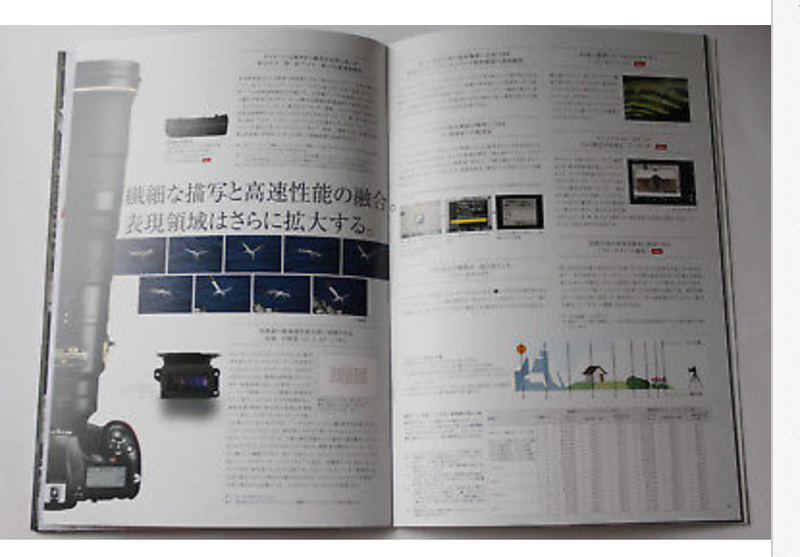 It is a 36-page color publication, 21 by 29.7cm, roughly 8.25 by 12 inches, with the text in Japanese. It goes for $12.75 with free slow shipping from Japan. Faster shipping is available for $5 more. If buy from a retailer that has an open marketplace like Amazon, make sure Amazon itself is the seller. If buying from retailers that also sell imported, and used and refurbished, make sure the version you buy is new condition with Tamron USA warranty. See rebate details in PDF file. Happy New Year to the various cascading time zones as we slowly enter 2018 around the world! The new condition Sigma 150-600mm F5-6.3 DG OS HSM “Contemporary” Lens is bundled with a FREE VU Ariel 95mm UV filter and $31.50 promotional rewards for $789 with free shipping for a limited time at Adorama in the Canon and Nikon SLR systems. No coupon, no rebate, just add to cart and proceed to checkout while this promotion is running. Also among their latest Year End Sales, Adorama is offering the new condition Apple 10.5″ iPad Pro (Wi-Fi, 256GB), Space Gray (2017), for $729 with free shipping. They are an authorized Apple dealer. F2.8 PRO zoom lens time now! Adorama is offering the new condition Tamron SP 24-70mm f/2.8 Di VC USD for $899 with free shipping and $36~ promotional rewards for a limited time in the Nikon F system and the Canon EF system. No coupons, no rebates, just add to cart and proceed to checkout. The Sony A version is not on sale. Back to the eBay Deals where we have a new low price. The manufacturer refurbished Nikon D3400 Two Lens Kit with the 18-55 and 70-300 DX lenses has dropped from $400 to $390, but also lost the $20 eBay gift card that had during the Black-Cyber season. It also gets a Nikon gadget bag. I don’t recall if this was included the Black-Cyber offering. They come with a 90-day Nikon USA warranty. The other Tamron lens that has joined the B&H Photo 2-Day Sale is the new condition Tamron 16-300mm f/3.5-6.3 Di II VC PZD MACRO going for $499 with free expedited shipping and a FREE Hoya 67mm UV Haze NXT HMC Filter along with 4% ($20~) promotional rewards in Canon, Nikon, and Sony A systems. The Canon and Nikon are VC (stabilized) while the Sony A is not. This is the first of three lenses that are hitching a ride on the B&H Photo 2-Day Sale, it is the new condition Tamron 18-200mm f/3.5-6.3 Di II VC going for $199 with free expedited shipping and with 4% promotional rewards ($8~) in the Canon, Nikon and Sony A mounts. The Canon and Nikon are VC (stabilized), the Sony A is not. The new condition Tamron SP 150-600mm f/5-6.3 Di VC USD G2 going for $1299 with free expedited shipping along with a FREE Tamron TAP-in Console and 4% ($52~) promotional rewards in the Canon and Nikon. The Sony A version is not VC, and it does not get a free TAP-IN console. The sale ends Saturday 12/30/17. The FREE NEXT DAY Delivery promotion ends Thursday at 2pm ET. There’s no coupon needed for the free next day delivery ~ you see the option on the product page while this offer is running. An update fo the Stock Status Tracker has a $120 price drop on the imported grey market new condition Nikon D850 body only from $3400 to $3280 with free shipping by eBay seller Deals All Year. The new condition price at authorized Nikon USA dealers is $3300. The first three items are Canon and Nikon specific in each Canon and Nikon bundle. The bottom two items are universal. SOLD OUT: we have good news for you Nikon D850 hunters. There are four new condition units available (as 7:04pm ET recheck) for $3300 with free shipping by Kenmore Camera from the state of Washington. They are authorized dealers! Select Pentax gear are not the only ones eligible for the 20% off Prime Credit Card Statement Credit promotion. There’s a Tamron lens as well, available in either the Canon or Nikon DSLR system. The new condition Tamron AF 70-300mm f/4.0-5.6 SP Di VC USD XLD goes for $450 at Adorama and B&H Photo with 4% promotional rewards. The same price is available at Amazon by Amazon itself. If you pay for this with either one of the Prime credit cards, you will get a 20% statement credit, which is $90 in this case! This is a limited time offer! You can find details and all the eligible products through the Prime 20% Statement Credit offer page. This is the third of the Adorama Flash Friday coupons! The same coupon code 12152017 (that’s today’s date, not a personal coupon number) gets you the new condition Flashpoint StreakLight 360 Ws Flash TTL for Canon with BP-960 Power Pack for $299 with free expedited shipping in your choice of Canon (the previous link) or the Nikon system. This is a limited time only coupon offering! I just updated the Stock Status Tracker and there is a “discount” on the limited availability premium of the Nikon D850. The camera’s official price is $3300 at authorized dealers, but it went over $3500 by importers who had it in-stock. Now the “limited availability premium” is shrinking, it’s “only” +$100, you can get it in imported grey-market condition with a 1-year seller warranty (not Nikon USA) by eBay seller Deals All Year (New Jersey) for $3400 with free shipping. … to the eBay Deals we go where eBay seller “Deals All Year” is offering the new condition Nikon D850 body only for $3775 with free shipping and a 1-year warranty from the seller, not Nikon USA. Limit one per buyer. Sunday is here, and with it we have a new round of Nikon DSLR instant savings, including the first official discount of the D7500 APS-C camera. The body only goes for $1147 with a FREE 32GB Sandisk Extreme card and Ruggard shoulder bag and 2% promotional rewards (around $23 to be used in future purchases) at B&H Photo. Or if you are interested in a “take pictures with” kit, the D7500 with 18-140 DX VR goes for $1447 with the same two freebies and 2% promotional rewards (about $29 to be used in future purchases at B&H Photo).